Despite the corporate media narrative that Hillary Clinton has an enthusiasm problem with young voters, she is dramatically outperforming President Obama's 2012 numbers with people under 30 — especially women. For most of the 2016 election cycle, the national media have painted young voters as cynical, dissatisfied with both choices, and unable to find inspiration in Hillary Clinton — a narrative they have perpetuated by not giving airtime to Clinton's actual supporters. But a new poll from the Harvard Institute of Politics shatters this myth. The poll finds Clinton leading Trump in a four-way race by +28 points among people under 30. 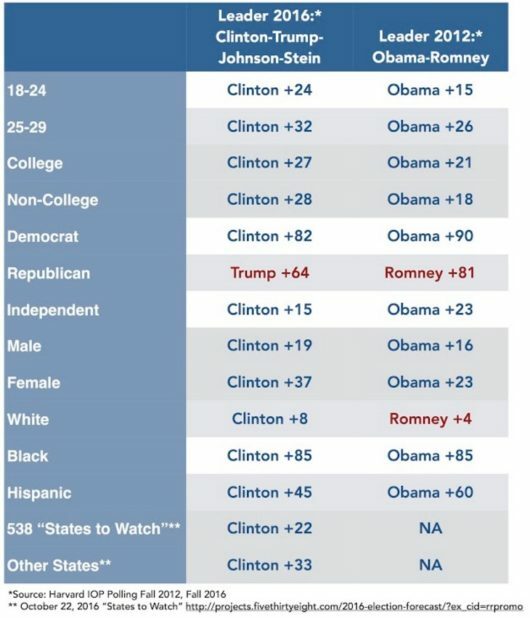 By contrast, President Obama led millennials by just +15 points over Mitt Romney in 2012. The numbers are even more astounding for young women: Clinton leads this group by +37 points, which is nearly twice the amount Obama led them in 2012. It is small wonder that the Trump campaign's only strategy in the final stretch of the race is a scheme to stop young women from voting. The opportunity to put the first woman in the Oval Office has galvanized millennial women voters in a way that nothing else has.